S-Box™ pop-up socket and storage innovations are unique. Not only do they lift at the touch of a finger, they offer both Designer and Client much more than might first appear! Built from solid steel for strength and durability all models have the built-in ability for their tops to be exchanged for one that matches their surroundings! The S-Box™ Patent enables all units to be installed either just as they are or customised with a different material – whilst still maintaining their automatic ‘pop-up’ action! No other ‘self-lift’ system in the World can do this! S-Box™ products uniquely provide any countertop with both Clever Kinetics and ‘Chameleon’ skills! S-Box™ products make clever use of the wasted space at the rear/corners of cabinets; the voids in kitchen islands; or dead zones within interior furniture. All units can be supplied with a steel top and collar already fitted, ready to drop into a rectangular hole created by the worktop supplier. This “Surface Installation” is the simplest method and might be regarded as a Route 1 option. Route 2 is much more interesting and uses the product’s unique adaptability. It can be mounted 20mm below the counter surface to create an almost invisible installation, by using a piece of counter material as its top! At last, there is a “designer” solution for countertop power. Just fit it your way! 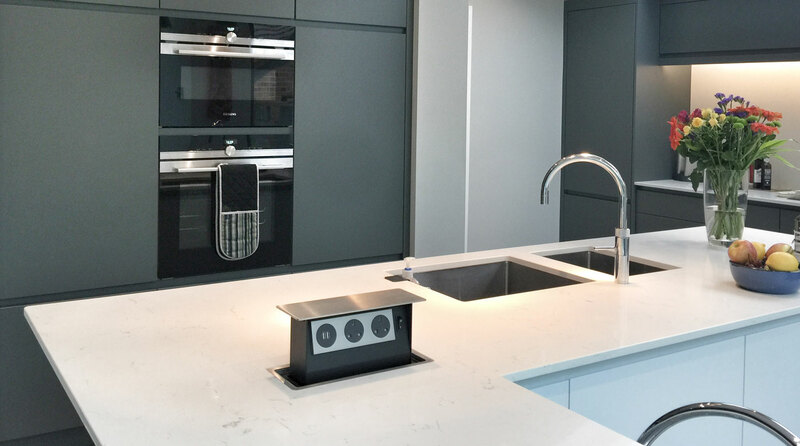 Ask your Designer or Worktop provider to include a space-saving S-Box™ in the plans for your scheme. S-BOX™ POP-UP SOCKETS HAVE PASSED THE LATEST 2 LITRE COUNTERTOP ‘SPLASH TEST’ AND ARE U.L. LISTED FOR USE IN KITCHENS AND BATHROOMS. S-Box ‘pop-up’ units can be fitted either on or below the work-surface. A steel top or a custom top can be used depending on the look you require for your individual scheme. Installation is therefore either SURFACE FIT or REBATED based on the installation desired.